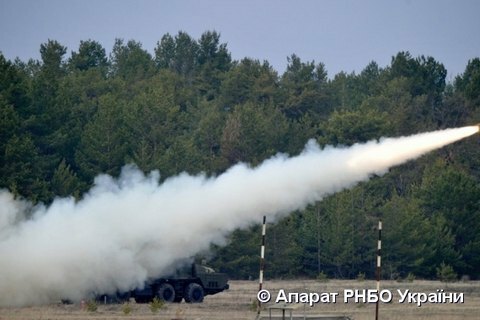 The test of a Ukrainian-made missile on a firing range on 22 March proved a success, the press service of the National Security and Defence Council (NSDC) has said. "We have now started fire testing Ukrainian-made missiles and today's launch has proved our missile fully up to the task and it hit the planned target sharp," NSDC Secretary Oleksandr Turchynov said. Unlike a similar Russian missile, the Ukrainian one is guided "which allows it to be used much more effectively". He recalled that the Ukrainian defence industry was tasked to ensure the manufacturing of missiles without Russian parts. "The defence industry and scientists did a decent job fulfilling this task," he said. He added that they were now working on other missile programmes. "We are preparing a number of powerful and effective missiles for use to reliably protect our country," he said. In Turchynov's words, restoring the missile shield is one of Ukraine's priority defence and security tasks. Ukraine stopped military and technical cooperation with Russia back in 2014.